When it comes to brand marketing, there are, like, a zillion ways to slice and dice an audience. Let’s start with the obvious way to define audience: personas based on role. By partitioning people inside discrete, functional segments, we can describe practical interaction with the brand — how it’s used, adopted or perceived — based on homogenized character motives, patterns and responsibilities. Personas are effective, but one-dimensional. They only describe a character (who am I? ), not necessarily a relationship (where do we stand?). Relationship is tricky. I mean, what is even the baseline? We need a common denominator, a universal to any company/product/personal brand. Using financials as a brand barometer sounds superficial, but it’s not. Black ink matters. Financial performance equals brand performance, even for nonprofits. This is a highly pragmatic way to frame a relationship between people and brands. So let’s put personas aside and instead map relationship by slicing audience based on financial investment to the brand. A person could be an all-chips-in evangelist, a minor investor, zero-investment oblivious, or anywhere within that spectrum. Together, traditional personas and relationship mapping can enable precision audience targeting and better communication. Let’s explore. Imagine, for a moment, a radio station broadcasting your brand. The center is the source of your signal. Like radio waves, proximity matters; brand signals degrade reaching over distance and dodging through obstacles. At a certain point, the signal disappears completely. Now envision four concentric rings expanding outward from our radio tower. Each ring is a stage of financial dependence. Clustered tightly around our radio tower are individuals whose livelihoods are literally dependent upon the brand’s success. Typically, these are company founders and employees. If the brand tanks, they’re in trouble. Unless you’re a trust-fund wanker spending your days with doses and mimosas, most of us are financially dependent upon at least one brand — typically our employer. This white-hot proximity tunes Dependents into the brand signal. Above all else, they crave clarity. Ambiguity is uncertainty, and that unravels financial stability. This is a double-edged sword. On one hand, Dependents are sensitive to brand weaknesses, and are the coal mine canaries that first sniff trouble. On the other hand, these folks can act as the brand’s fiercest defenders and ambassadors, amplifying the signal to more distant rings. Just outside the Dependents are the Patrons. At one point in time, these folks financially invested in the brand, but they are not literally dependent upon its success. Customers are the most important Patron group. Shareholders and equity investors are another. Patrons actively listen for the brand signal. They talk to the company and read the news. However, because they don’t live it every day like employees, that signal arrives weaker and more sporadically, often indirectly. Not every message is heard. A brand must work to keep Patrons satisfied and informed. When this group is happy with brand performance, they are the most effective advocates to the Watchers, our next group. Our third ring are the Watchers. Far less dense but still willing recipients of the brand signal, these individuals have no financial ties to the brand, but are still paying attention. The most important segment of the watcher group are prospective customers. It also includes financial analysts (Goldman Sachs, etc) and industry analysts (Gartner, etc), as well as media like reporters and bloggers. And of course the general public and their social punditry. Watchers harbors natural and healthy skepticism despite being the target of most marketing and public relations. A brand must work extremely hard to maintain a positive perception. Patrons, our previous ring, are the most effective way to draw Watchers toward the brand. Customer case studies, testimonials, recommendations, App Store ratings, eBay seller scores, TripAdvisor reviews and the like are highly effective. In the B2B world, concepts like Net Promoter Score and Voice of the Customer are increasingly popular for this reason. Beyond the Watchers is the last ring, which is not really a ring at all, but the ever-expanding and infinitely variable universe of uninitiated. In a nutshell, these are the folks disassociated and mostly unaware of your brand. The signal to noise ratio is low here; the brand is more perception than fact, more hearsay than direct experience, more unknown than known. Mythology and infamy run strong. The brand signal reaches this place in fragments, rarely as the organization intended, more impression than expression. Marketing campaigns can only build awareness at this level. 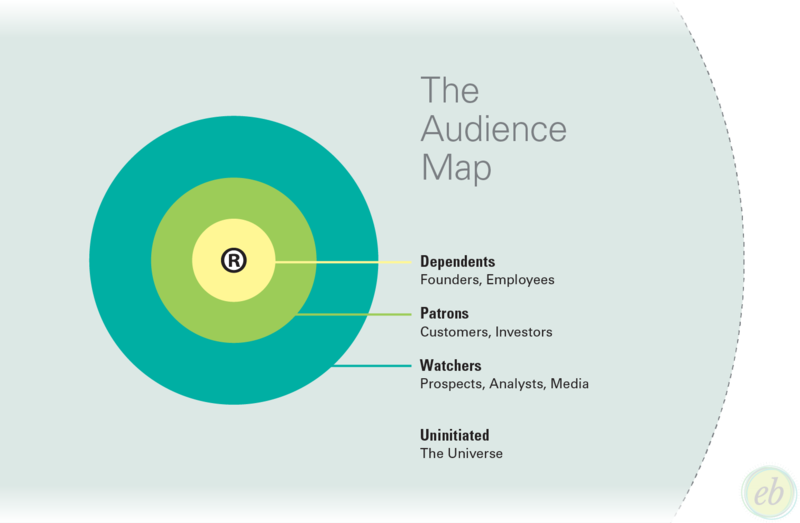 A basic audience map captures layers of financial investment to a brand. Typically, brand strategy furthers one agenda: growth. Growth is when all of these rings are growing together. 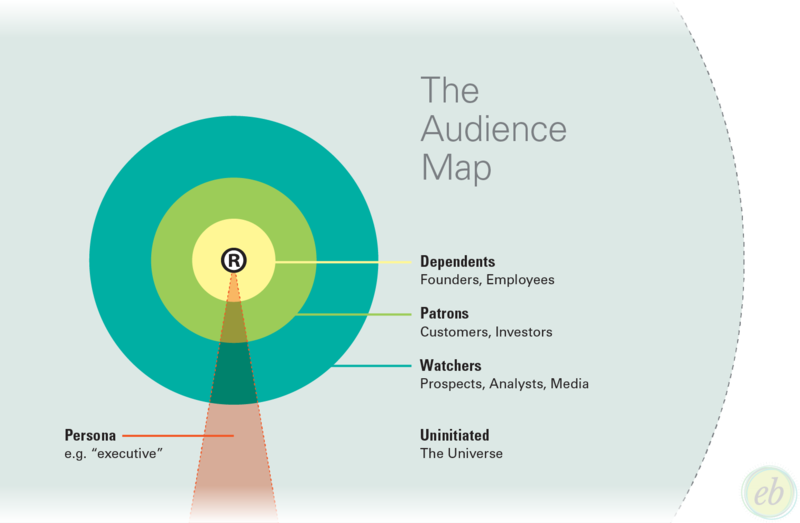 Each audience ring expands by cannibalizing from those farther out. Members of the inner ring can come from anywhere. But to grow Patrons, we pull from Watchers. To grow Watchers, we pull from the universe. The universe, of course, has no problem growing on its own. If we think about our brand signal stretching across our audience rings, personas are vertical audience segments that cut into the horizontal layers. Consider the “executive” persona, common to so much brand marketing. In the inner ring, it’s very small — a few people, typically. But many executives exist in the Patrons, more in the Watchers, and a bazillion in the uninitiated universe. We end up with an infinite pizza slice of a role-based group segmented four ways. Layering a role overtop an audience map provides a second dimension. Messaging and marketing to each segment of that “slice” can be significantly different even though the persona is the same. Mix in more vertical personas, and we end up with a tasty map that lends itself to more purposeful messaging. For example, instead of targeting “executives”, we speak to “executives of current customers”, where we immediately have assumptions: this is decision-making leadership that at some level is questioning, defending or advocating the investment in your brand. Two dimensions enable better outbound communication and more relevant brand measurement and analysis of messaging and tactics. At a minimum, this model provides two key facets of our audience: what they want, and their level of investment to get it from you. A third dimension would be journey. Is a persona’s relationship with a brand ascending, peaking, or descending? Harder to plot, certainly, but intriguing regardless. With advances in analytics and marketing automation techniques, this is closer than ever. Regardless: the more specificity we have when kicking off communication, the farther and clearer our brand signal will land on interested ears. If it struck a note, recommend it to others with a quick click on the heart icon below. If you’re interested in digging deeper, please consider subscribing to the Evoking Brand publication. Writer, designer, brand wonk. Strong coffee, stronger opinions. Listener of good music. An American living abroad in Germany. Crossing the streams of brand strategy, messaging and voice, and content strategy to create meaningful brand storytelling.